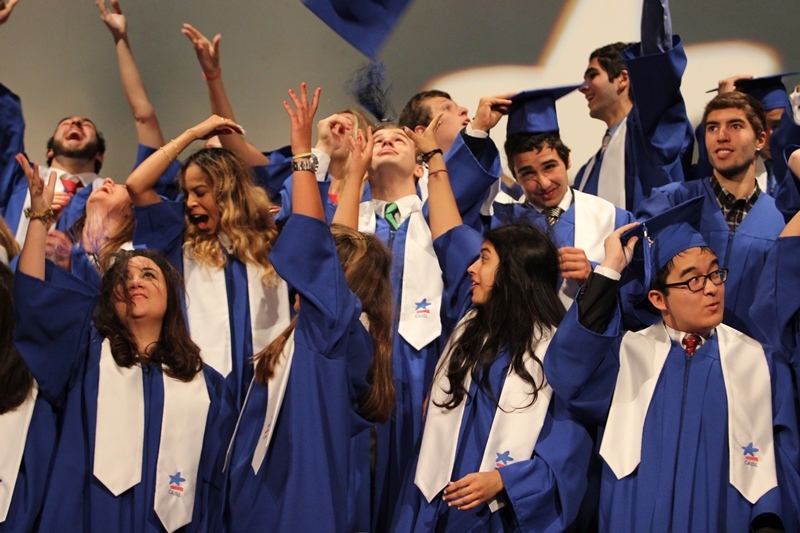 CAISL auditorium was abuzz on Sunday June 1st with the excitement of the 2014 Commencement ceremony; the talk of proud families filling the auditorium rows, the procession of gowned seniors to the tune of Pomp and Circumstance, and the playing of the American and Portuguese national anthems. The anticipated key note speech was given by recently appointed U.S. Ambassador Robert Sherman, who honored the CAISL community with his first official address in Portugal. Sherman´s address touched on his connections to this country through growing up in a Massachusetts town with a large Portuguese immigrant community and then emphasizing Portugal´s importance as a political and personal ally of the U.S. In his advice to CAISL seniors, Sherman urged them to use the example of Frank Carlucci´s career to be unafraid to take chances, follow their passions, explore all options before settling on a definite life path, and use failures as learning experiences. A speech by Valedictorian Mariana Matias outlined 14 years of CAISL experience, from first forming letters in Primary School through to the rigors of IB learning. The recognition of high-performing students in various disciplines from Fine Arts to Athletics was accompanied by the presentation of a Community Service award by Gisel Pinto Teixeira on behalf of the American Chamber of Commerce. American Club director Curtis Stewart continued a long-standing tradition of handing out the Portuguese Language and Literature Award, and the recipients of the President´s Award for Academic Excellence, a recognition of outstanding scholarship from the U.S. Department of Education, were announced. Sprinkled between presentations were several choir and orchestra performances, including a touching rendition of “Seasons of Love” sung by the entire senior class. Director Blannie Curtis took to the podium to give words of wisdom, speaking to opportunities available to those who have gained independent thinking, leadership, and creativity through the attainment of an American diploma. Ms. Curtis examined the unique composition of the class, adding in personal anecdotes and outlining the contributions made by students, concluding that both the seniors and the school have been enriched by their CAISL experience. As caps flew into the air, the 2014 graduation ceremony came to an end and the fresh-faced graduates filed off the stage and, with the best wishes of the CAISL community behind them, into a promising future. To view photos of Commencement, click here.